Reynolds, Leslie. 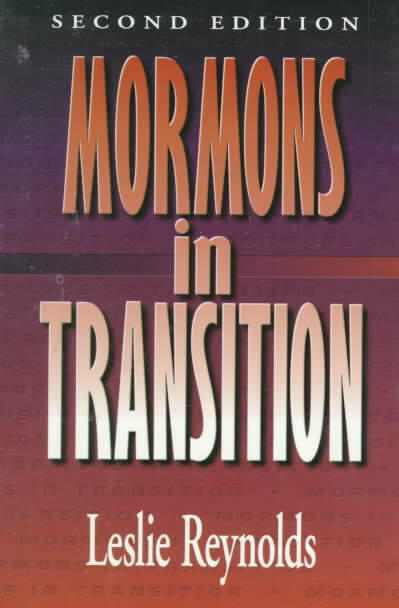 Mormons in Transition, 2nd edition. (Baker Book House, 1998), 144 pages, ISBN: 0801058112. What does it mean to transition out of Mormonism? How does it affect your family, your faith, your future? While pursuing her Master’s degree in Christian studies at Regent College, Leslie Reynolds had the opportunity to interview a number of Mormons, some currently involved in the church (of Jesus Christ of Latter-day Saints), some in the process of transitioning out and a few who have left the church. As Ms. Reynolds states, “Leaving the LDS church can be painful. As both a former Mormon and a former psychotherapist who has suffered a painful crisis of faith, I intend this book to help former Mormons in various levels of pain to heal and to help others, both Mormon and non-Mormon, gain perspective on the LDS church and their experiences with it" (page 21). "As both a former Mormon and a former psycho-therapist who has suffered a painful crisis of faith, I intend this book to help former Mormons in various levels of pain to heal ..."
Beginning with a general overview highlighting the difference between the LDS church and traditional Christianity, the book then moves right into selections from Ms. Reynolds interviews with Mormons as well as former Mormons. The focus is on the reasons a person begins to doubt the church, where that path leads them and, for some who converted to traditional Christianity, then shows the reality of what a difference having a personal relationship with Christ can make in their lives. The author does a good job of maintaining an unbiased, objective attitude, "My intention in quoting from these interviews is neither to confirm nor agree with the observations of the respondents but to record and describe their experiences in a context that can make their transition from the LDS church understandable" (page 37). Mormon readers who have some questions about the church will most likely be aware of a connection with those interviewed. They may share similar experiences and feelings. As understanding of the differences between Mormonism and Christianity grows so too do the conflicting feelings according to Ms. Reynolds. She writes, "I know that Mormons consider themselves Christians, as I consider myself a Christian. However, we worship different Gods and acknowledge a different Jesus" (page 26). Mormons in Transition touches on how many of those interviewed first began doubting the church because it failed to meet their basic needs. One of those unmet needs was the loss of the ability to freely ask questions about the church and receive thoughtful replies. One of the interviewees, Lynda Cooley, a master's level public school teacher, commented, "I can't remember exactly when it started ... If I asked too many questions, they would reprimand me for it" (page 39). This book goes on to point out the control that the Mormon church exerts over its members. University of Utah philosophy professor Sterling M. McMurrin says, "To a remarkable degree the church has concealed much of its history from its people, while at the same time causing them to tie their religious faith to its own controlled interpretation of its history" (page 40). Respondent Will McGarvey points out how important it is to deal with the doctrinal differences, "As we grapple with these issues, [investigators] can go either way. Mormons tend to see questioning as something leading them away from their faith and the one true church .... When you look from a faith perspective, the only way our faith grows is when we grapple with issues .... Grappling allows our faith to grow. [Faith] doesn't stand still. It either grows or dwindles" (page 97). The author found that those who had doubts about the LDS church typically fit into one of two categories. The first group tended to be those who were hurt and wounded, experiencing a sense of floundering and of being concerned about becoming involved in any kind of religion. This group often chose to stay in the church despite their knowledge of its' inconsistencies. Richard, one of those interviewed commented, "It's a strange thing in Utah for the heterodox Mormon, or the lapsed Mormon, because the gentiles don't trust you — you're too Mormon for them. And the orthodox Mormons don't trust you — you're too heretical for them. So you end you being in this sort of limbo." He described the pain as subtle, "not a biting, stinging sharp pain, It's a dull day-to-day sort of thing ... You're sort of shunned in an almost imperceptible way." (page 83). The other group were those who ultimately experienced healing through traditional Christianity. These were not people who necessarily wanted a personal relationship with God. The author says, "Indeed it appears that the former-Mormon Christians I interviewed were captured by rather than attracted to Christianity. They were not looking for the Jesus of the Bible, but he found them (page 86). Ms. Reynolds goes on to relate from her personal experience, "I believe that having a personal relationship with the Christ of the Bible will rid one of the grief felt at leaving the comfort of the LDS church. I found no peace until Christ captured me for his kingdom .... I did absolutely nothing to earn my salvation. I wasn't looking for it. It was a free gift" (page 92). The final chapter of Mormons in Transition is written to Christians who have a desire to reach out to the Mormons around them. It highlights some of the common mistakes that others have made in their zeal to share the errors of Mormonism. It goes on to show what works. Niki, one of the respondents, says, "The most helpful thing that Christians did to influence me was to simply express their own convictions about God's presence in their lives .... a Christian expression of personal faith and belief was hope for me that perhaps Mormonism was not the only access to God, and that perhaps my fear that I would be corrupted was unfounded" (page 121). For the questioning Mormon, and for those non-Mormons who want to know more about Mormonism, this book is a valuable resource. Mormons in Transition is well documented with extensive notes and bibliography. An additional feature is a glossary of common terms with the LDS and, where appropriate, Christian definitions. A wide range of misunderstanding exists between Mormons (members of the Church of Jesus Christ of Latter-day Saints) and traditional Christians. As Presbyterian Pastor Jeff Silliman says, "There are semantic barriers to communication. We have a lot of words in common, but these words are understood one way in historical Christianity and another in their tradition." Words used by one group may offend the other. For example, one Mormon I interviewed was offended because I referred to myself as a Christian, an acceptable designation in the traditional Christian culture, where we do not belong to a church, per se, but are followers of Christ and can worship in any denomination that suits us. He apparently believed I was claiming membership in another "one true church," albeit a different one from the LDS church. I know that Mormons consider themselves Christians, as I consider myself a Christian. However, we worship different Gods and acknowledge a different Jesus. Throughout this book, I will use the term Christian to refer to traditional Christians, or members of the historical body of Christ. These Christians are followers of Jesus, who is God, one with the Father, and they also acknowledge Jesus as their personal Savior. I noticed in my interviews with people who identified themselves as Mormons that a majority of them thought they understood the beliefs of other churches. But as they started to explain these beliefs to me, most of them became aware that they do not. Over forty years ago I was taught that non-LDS churches were of the devil. This belief definitely limited my investigation into other denominations and their beliefs. Although this incorrect teaching of the past has apparently been altered to the position that "most religions have some truth," most of my respondents were ignorant of more traditional Christian beliefs and the differences with the LDS religion. The LDS church and traditional Christianity have been at odds since Mormonism's inception. The LDS church calls traditional Christianity the result of a "Great Apostasy" (see apostasy in the glossary), while the traditional Christian is likely to call the LDS church a cult or a collection of well-known heresies with a twist — the anthropomorphizing of God. Traditional Christianity stresses that people are saved by grace alone through belief in Jesus Christ. Whereas, while Mormons believe in the mission of Jesus Christ as Savior of the world, they believe they can only be exalted through their own works. Frequently, traditional Christians are aghast at what they see in the LDS faith as a human physicality limiting their majestic God, while Mormons don't relate to a God of spirit, particularly one that is three beings in one — the Trinity. The LDS church has a godhead of three separate entities. Historian Jan Shipps maintains that the LDS church is neither a Christian denomination nor a heresy, but something new. She asserts, "despite the surprising similarity between some of the modern cultural manifestations of Mormonism and American evangelical Protestantism, Mormonism started to grow away from traditional Christianity almost immediately upon coming into existence. The group recognized Joseph Smith as a prophet of God, published new scriptures, restored the Aaronic priesthood (and later the Melchizedek priesthood), and instituted other traditions "that now distinguish their tradition from the Christian tradition as surely as early Christianity was distinguished from its Hebraic context." Another historian, Ruth A. Tucker, agrees: "The Mormon church is not merely a denomination that differs with other denominations on secondary or peripheral doctrines or practices; rather, it is a new religious movement which differs from Christianity on primary and essential doctrines and that stands alone with additional scriptures and beliefs that have never been a part of historic Christianity." Yet another historian, Ken Mulholland, labels the LDS church as a specific culture, "an ethnos [people] in a cultural sense, and they do have a very different way of conceptualizing truth than we do as Christians." It is not within the scope of this book to explain all the theological differences between the LDS church and traditional Christianity. I will, however, present a short introduction to the tenets of Mormonism for the reader who is not familiar with the church and its theology. I will then contrast Mormonism with historical Christianity. I refer the reader seeking further definition to this book's glossary, which gives more extensive definitions of the words that may be used in different ways by the LDS church and traditional Christianity. Doctrinal and cultural usages are also often listed there.